Bear Stearns was proposing to transfer some of its hedge-fund assets—a significant number backed by subprime mortgages—to Everquest, and to issue an IPO. Those assets included mostly collateralized debt obligations (CDO), complex packages containing many loans—and the subject of Tavakoli’s 2003 book. 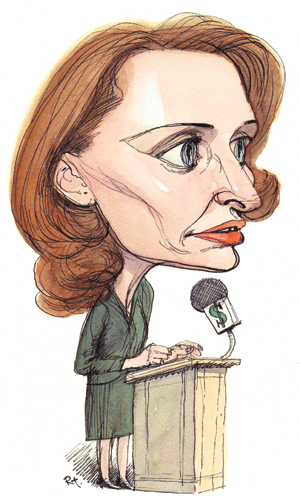 She told Goldstein that “these assets aren’t suitable for retail investors,” she recalls. They were too complicated. “Retail investors would have no chance at analyzing these securities.” Furthermore, Everquest’s funds “were meant to be a high grade,” Tavakoli says, giving investors the impression that they were safe buys, but they actually included some risky portions of CDOs and some subprime mortgages, which by then had already begun to implode. Goldstein’s May 11, 2007, article was the first to question Bear Stearns, noting the move looked like an attempt “to pawn off risky assets onto retail investors.” It quoted Tavakoli calling the firm’s close ties to Everquest a “moral hazard.” Soon lenders pulled their credit lines to the two Bear Stearns hedge funds involved; by June the IPO was withdrawn, and the company sparked a market panic when those funds collapsed. After announcing the first loss in Bear Stearns’s eight-decade history in January 2008, in March, with help from the Federal Reserve, it was bought by JPMorgan Chase. It wasn’t the first time Tavakoli was ahead of the financial pack. When she wrote Credit Derivatives (John Wiley & Sons) in 1998, she didn’t know that the risk-transferring contracts “were going to take off the way that they did,” she says. “I was just clarifying some of the key issues in that market,” using knowledge she gained on trading desks in New York and London. The global credit-derivatives market, with $5.44 trillion in outstanding contracts in 2003, increased to $62.2 trillion in 2007. (This past January BusinessWeek Chicago called her “the Cassandra of credit derivatives.”) After penning a second editionin 2001, Tavakoli focused on one type of structured financial product for Collateralized Debt Obligations & Structured Finance (John Wiley & Sons, 2003; second edition due in September), warning of flaws in both the structuring and rating systems. Tavakoli didn’t plan a career in finance. Growing up first on Chicago’s West Garfield Boulevard and then in Oak Brook, Illinois, she’d tag along with her doctor father on house calls and to the hospital, where she (and sometimes one or more of her eight siblings) would visit patients they knew. “I always liked science,” she says, “I think partly because my father had all these books lying around, the New England Journal of Medicine.” At the Illinois Institute of Technology she studied chemical engineering and met an Iranian PhD student. After graduation they married and moved to Midland, Michigan, and then to Iran, where they both worked as chemical engineers. Soon Salomon Brothers offered her a job, and she moved to New York in 1985. “I was in the Liar’s Poker training program,” she says, referring to Michael Lewis’s 1989 Wall Street exposé, which detailed traders’ childish behavior during training sessions. “I was one of the people who was actually paying attention, not one of the spitball throwers.” Then she joined Bear Stearns—“back when they had a good reputation”—working with “the geeks”: PhDs analyzing the assets and liabilities of large U.S. portfolios. “Based on that analysis, clients would trade.” Between two stints in London, Tavakoli spent the summers of 1999 and 2000 as an adjunct at the GSB, teaching Futures, Forwards, Options, and Swaps: Theory and Practice. Tavakoli’s strong opinions have earned her some high-profile admirers. In 2005 Warren Buffett—who has called credit derivatives “weapons of mass destruction”—invited her to stop by to discuss them the next time she was in Omaha. Although flattered, she ignored his letter for two months. “I wasn’t quite sure what I was going to say to Warren Buffett.” She finally wrote back explaining that business wouldn’t bring her to Omaha in the near future, but she would be happy to fly there. He responded that he’d buy lunch. When she began her own firm, Tavakoli had planned to run it for five years. Now that time has come and gone, and she has no desire to retire. “Having worked this hard to get the business to this point,” making decisions about how to operate and what kinds of clients to take, “it’s actually easier in some ways,” she says, and “a lot more enjoyable.” She’ll keep running her business, although perhaps with a different focus. “It’s always good to take another look at the landscape and say, ‘What’s going to be the most useful thing to do now?’” If past experience is a measure, her next move may foretell the next big thing in finance.